Less than 17 months after the last plane left Edmonton’s City Centre Airport, city planners are in the early stages of transforming the site into an innovative new community they hope will take off. Blatchford — named after Kenneth Blatchford, who served as Edmonton’s mayor from 1923 to 1926 — is a 536-acre property that’s envisioned to one day be home to up to 30,000 while employing another 10,000. Blatchford is loosely bordered by Yellowhead Trail to the north, Kingsway Avenue to the south, 121 Street to the west and 107 Street to the east. In addition to two primarily residential districts on the east and west sides, it will have a commercially oriented town centre, a community civic plaza and significant park and green space. The City of Edmonton is responsible for installing underground utilities, roads, parks and other horizontal infrastructure, and estimates it will cost a little more than $700 million over 25 years. Removing six former aviation buildings and hangars and about 50 acres of runways, taxiways and other hard surface areas began last year. Grading of the site, digging the first stormwater pond and infrastructure construction is expected to start this summer. 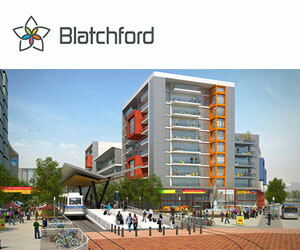 Blatchford’s design is something Edmontonians haven’t seen before. ☛ and a district heat system that will enable Blatchford to ultimately use 100 per cent renewable energy. “On the west side of the site we’ll primarily be looking at street-oriented units, so townhouses and low-rise apartments and condos,” said Hall. Architectural and design guidelines to define the look, feel and character of the neighbourhood are being set and sustainable building performance standards are being developed. All buildings in Blatchford will be designed to be energy-efficient and to use lower-than-average levels of water and energy. A recommendation for a holistic energy strategy will be presented to city council. Builders for the first stage of development will be selected this year. The city will sell lots to them and, in turn, they’ll sell directly to homebuyers. The goal is to have people starting to live and work in Blatchford sometime in 2017, and it’s hoped more of them will walk, ride bicycles and use public transit instead of relying on cars. There’s also a plan to accommodate the expansion of the Northern Alberta Institute of Technology (NAIT), which is looking to consolidate satellite facilities and create a central campus on the east side of the site. Hall said the Alberta economy has always been cyclical and he doesn’t expect the current slowdown brought about by low oil prices to negatively affect Blatchford. However, he conceded the situation is being closely monitored and that such key indicators as investment and migration are being watched. “We can adjust what we take to the market for these specific market conditions as we move along,” Hall said. “This is a multi-stage project and we know there are going to be strong periods in our economy and there are going to be weaker periods, and we’re just alert to knowing when we want to be investing and to what extent.